Slowly but surely, China is beginning to have an impact on the global scene of professional boxing. Two recent examples over the last five months help clearly illustrate this point. The first happened November 24 of last year when Xiong Zhao Zhong made history as he defeated Javier Martinez Resendiz by unanimous decision to claim the vacant WBC Minimumweight Championship, giving him the unique distinction of becoming the first Chinese boxer to ever win a major world title. The other occurred just over a week ago when two-time Olympic Gold Medal winner Zou Shiming reportedly earned an astounding $300,000 for his professional debut, a victorious four round contest that was broadcast virtually everywhere in China. The fact that these two success stories unfolded at a time when boxing was already experiencing growing popularity in China is surely no coincidence. Quite the contrary, when considering the noticeable momentum Chinese boxing has gathered since competing in its first Olympic Games in 1992, it is reasonable to believe that this trend will continue and we will inevitably see more and more Chinese talent (and champions) surface in the foreseeable future. This past Friday another Chinese boxer made headway in a groundbreaking performance when lightweight Ik Yang (12-0, 8 KOs) defeated Mexican pugilist Ivan Zavala by second round knockout. What made this victory noteworthy according to Yang’s trainer and co-manager, Chauncy Welliver, was that “he just became the first Chinese fighter to win on US soil in almost 85 years—as far as I know he is the first Chinaman to do this since Harry Soo won his last fight in 1928, and I looked pretty deep into this”. Despite sneaking under the radar largely unnoticed and without much fanfare or publicity, especially in the aftermath of Shiming’s high profile event, this is still a significant feat that could act as a foreshadowing of things to come both for Yang and for Chinese boxing on the American stage. 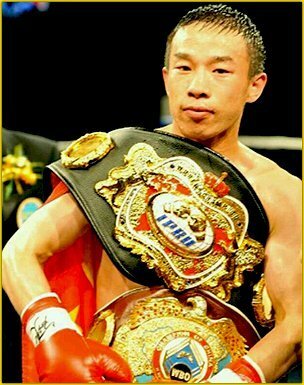 Yang began boxing professionally in 2007 and compiled an undefeated record through his first eleven contests where he competed exclusively in China and South Korea. The decision to come to America must have been a difficult one for Yang, who just recently celebrated his 28th birthday in Spokane, Washington. Making the journey to a new country alone without the company of friends or family can be a demanding hardship, especially when integrating oneself into a new culture without having mastered thorough command of the native language. Undeterred by these challenges, however, Yang is adamant about becoming a pioneer who leads this modern Chinese invasion of American squared circles. As Yang explained, “I want more Chinese to pay attention to boxing and like boxing because of me”. The unlikely pairing of Yang and Welliver was the result of the latter having competed several times over in China, where the Chinese fans were quick to dub the American fighter with a new battle moniker—The Boxing Panda. The two boxers had established an instant camaraderie. As Chauncy later recalled, “I met him over there in China and we hit off. We had been talking about him coming over here for awhile. Finally I said you know what? He told me he was looking for a manager. Screw it! I’m bringing him over here”. The newly teamed duo was successful in their first outing together where Yang started off patiently, used a measured approach, and awaited opportunities where he could let his hands go and put together some effective punches. Ultimately he would become more aggressive and ferocious, and with this electrified charge in intensity, his dejected foe was quickly overcome with great reluctance after being on the receiving end of Yang’s cruel assault. A pleased Welliver noted that “he went out there and he shined—he did something spectacular”. Following the stoppage victory, Yang haughtily draped himself beneath the cozy comforts of a large cape-sized Chinese flag and later explained, “I am so proud of being Chinese, that is why I choose to hold the Chinese flag over my head”. Yang is still very much a work in progress who requires some polish and refining, but Welliver and co-manager Roland Jankelson have high hopes for him. Looking to instill some American flavor into his existing style, they confidently have their sights set on keeping him working in the gym and busy in the ring. “We want to keep him active and obviously break him in and get him experience”, said Welliver. “Six fights in the next twelve months would be our minimum goal, and that’s going slow”. When asked what he thought of Yang’s prospects going forward, especially in light of recent headlines involving fellow Chinamen Shiming and Zhong, an elated Welliver eagerly exclaimed, “I think this kid will surpass both of those fighters! This kid really has the ability to be not only a champion, but a truly great fighter. Obviously those are some big expectations to live up to, but he’s got the potential to do it”. Whether or not Yang will ultimately win a championship or gain widespread popularity and acceptance like his fellow countrymen remains to be seen. But Yang is actively pursuing his dreams and boldly going where no Chinese boxer has gone since the days when Babe Ruth was still donning a New York Yankees uniform and Franklin D Roosevelt was but yet just a Governor. Yang is not dreaming small. He is definitely shooting for the stars and he has already taken what was potentially a huge step coming to the US, both for his career and the future careers of other boxers hailing from China. Next boxing news: Action packed ”Fight Night at the Park” Results from North Bergen, N.J.